We don’t like the idea of trash – we would rather like to see it as a resource. We don’t like the idea of buying new things when we can use secondhand. That is why we in our residencies and other activities recycle as much as possible and buy secondhand, share or borrow. If the EU directive on recycling of 50% of household waste by 2020 is followed, it will reduce CO2 emissions by 62 million tonnes of CO2 per year. The Danes produce approx. 13 million tonnes of household waste per year = 670 kg per person. We must both create less waste and recycle more. 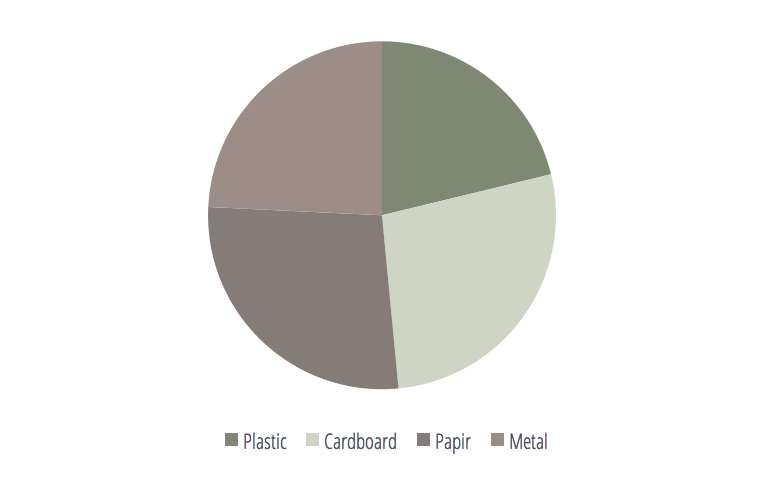 In our residencies in Denmark and Portugal we have recycled different types of waste; Plastic, cardboard, paper, glass, metal, textiles, wood, and hazard waist. From 2014 to 2017 we have calculated carbon savings from recycling for four different types of materials; Plastic, cardboard, paper and metal, by measuring the amount of trash that we have created during our residencies and workshops. In that time we have saved 682 kg of CO2 from recycling the four types of materials. The amount of savings is related to the amount of trash that we gain. Since 2016 was the year where we had the highest number of days with people participating in our residencies, we also had the highest impact of recycling. Even though more activities means producing more trash it is important to remember, that even with the smallest steps we can make a difference and start reducing our environmental impact. Recycling of metal has the highest environmental benefit of the four fractions. While the amount of metal only accounts for 9% of the weight of garbage collected, the fraction accounts for 24% of the total CO2 savings. Plates, glasses, bowls, forks and knives. Furniture – tables and chairs, tablecloths.